Passengers at Seaholme, Altona and Westona (the Altona Loop) aren’t too happy now that they have to change to and from shuttle trains during off-peak times on weekdays. How would you make them even less happy about it? Give them inadequate and incorrect information! (a) It doesn’t tell passengers for the Altona Loop which train to catch. (b) Instead it suggests Laverton passengers take a Werribee train and needlessly change at Newport… In fact Werribee trains stop at Laverton. If they followed the advice, their trip would take 24 minutes longer. (c) If Altona Loop passengers try and follow that advice, they may end up waiting longer than necessary, because outbound it’s the Williamstown trains which (theoretically) connect with the Altona shuttle. Probably the best advice for them is to catch the first train to Newport, then change. (d) And where is the information for Werribee line passengers beyond Laverton? (e) First column, third from bottom: Why does it think that to get from Southern Cross to Flinders Street you should go first to Clifton Hill? 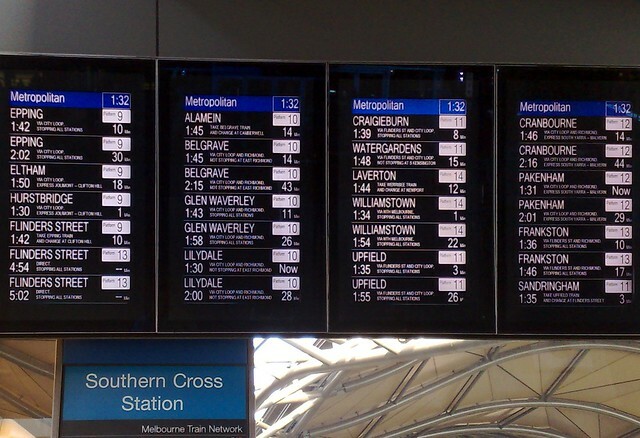 (f) First column, bottom: The time was 1:32pm, so why list trains to Flinders Street that are at 4:54 and 5:02pm when there are other services to Flinders Street shown departing in as little as 3 minutes? It’s probably inevitable that some train passengers will have to change somewhere on their trip. But if so, along with good interchange facilities and short waiting times, it’s imperative they are given accurate information. PT Problem of the Day: Who stops cars from blocking trams? PT Problem of the Day: Dude, where’s my train?